The Panasonic EPMA70KX has not only a cheaper price but is mostly available with offers of discount and sales. 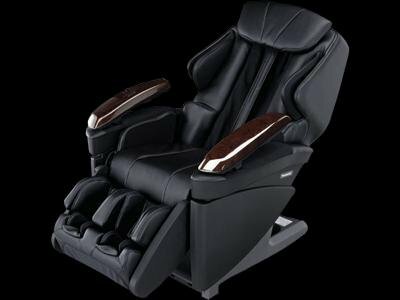 The price of the massage chair is $4,857.57 which as compared to the features it provides has a lot more worth than it currently has. The different alignments of the massage chair are in the arms and hand, hip and thigh, shoulder, buttocks, pelvis, thigh and calves. All the parts of the body are covered by the chair with a full body massage feature. The airbags along with the 3D reflexology technology give the framework enough built and power to handle even the toughest people on the chair and give as intense massage to them as they wish for. The chair is a solid built but is also tender for the ones who are less tough and small in size too. The way it works is yet another impressive surprise as it brings along the flexibility between the intensity control for both strong and fragile body structures accordingly. The best feature of this massage chair is the individual concentrated massage which is pretty close to the real human massage experience. The airbags are customised such that they adjust according to the armrest and palms and give a gentle yet effective massage upside down with the kneading technique. The recliner is stretchable enough to make the stretch angle go up to 170 degrees which is effective even for the ones who are taller than 6 feet. The shoulder massage for the broader shouldered people is also very accurate and not cramped up. As far as the cost goes, the massage chair works just fine but in case of the latest features, this chair has grown old. However many prefer the elder versions as they are believed to be stronger and reliable than the newer versions. The chair even after a huge expense of $4857.57 comes with a shipping charge of $166.77 and is said to be of late delivery a lot of times. The assembly work is not easy and takes a lot of time if not by the professionals working on it. The chair comes with a huge amount of weight and is almost an impossible job for one person to move or slide it around the house according to their wish. The lower back and lumbar massages were often painful for many people of all sizes. This was a malfunction in the earlier versions but has now been corrected and no more complaints have been registered after that. If you are a person who believes that old is gold, this massage chair is an authentic piece of work. It has all the necessary features for a person to relax and get his body relieved from the sore muscles and the stressful pain. The only thing that this product lacks is the latest features like smart phone pockets, wireless Bluetooth controllers and body scanning technology. But, these are additions to the basic and important feature that is providing a good massage to the user which it does perfectly.